The main markaz of Residencia is the D block, which comprises different sizes of fully developed commercial plots in the central location. Available plot sizes are 87.5×96, 80×80, 50×50, 35×35 and 30×30. Considering the location and bigger sizes of plots, this is certainly an attractive opportunity for builders to grab some plots for their commercial projects. 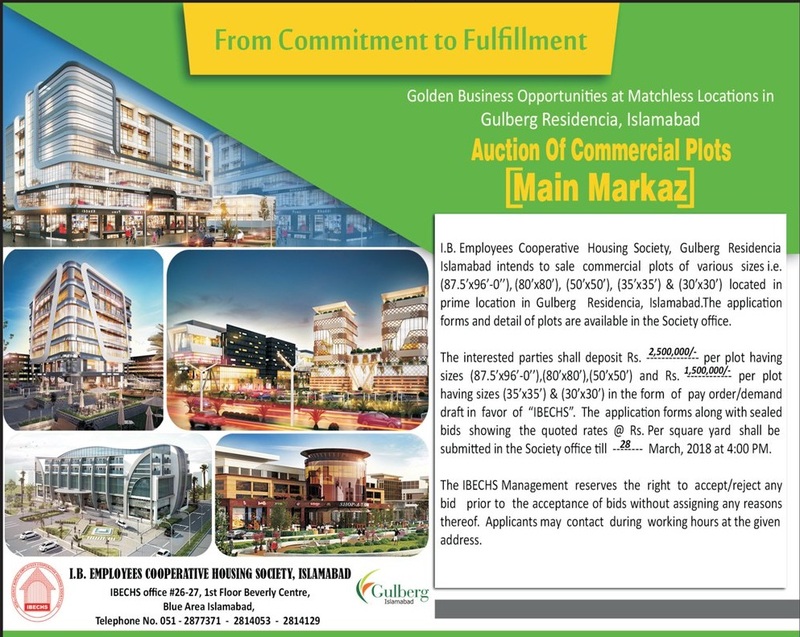 The application forms and details of subject commercial plots are available at the society office in blue area, Islamabad. The interested parties shall deposit token amount in the form of Pay order/Bank draft in favor of “IBECHS”. The deposit amount for bigger commercial plots, i.e. 87.5×96, 80×80 and 50×50 is PKR 25 Lacs, while smaller plots, i.e. 35×35 and 30×30 will require a deposit of PKR 15 Lacs. The parties can submit application form for a certain plot size along with sealed bid showing the quoted rates @ price per square yards by 28th March 2018. The IBECHS Mangement reserves the right to approve or reject any bid prior to the acceptance of bids without assigning any reason thereof. The applicants can contact IBECHS management during working hours at their office for assistance.